Battery operated timer which hooks in line designed to open and close the water flow used for watering, fertilizing, spraying or any other application which is watered by a standard outside garden hose. The best place to hook this up is right at the spigot. Just thread it on, power it up and configure it to open and close when you want water to openly flow through the attached hose. It runs on 4 “AA” batteries which will keep it powered for a year or more. Settings include once a day, every second day, every 3rd day, every 4th day, etc. 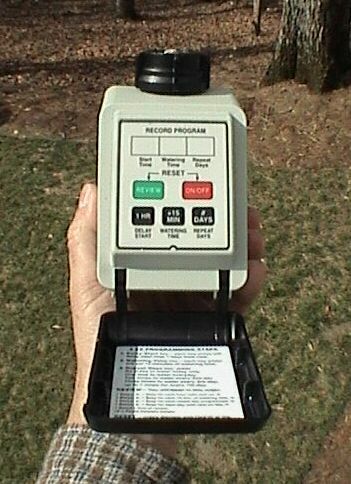 It features a button for quick bypass for when you need water and it’s programming is easy to set up. Ideal for timed watering of lawns and gardens.